Despite a longstanding relationship with Pininfarina, Ferrari awarded the design of their first mid-engined V8 car to cross-town rival Bertone, a decision that Pininfarina then, and many since, have rued. The seller of today'sNice Price or Crack Pipe 308 GTB4 has tried to rectify the styling, but his price might also wreck-tify it for you. The litany of firsts for Ferrari's 308 GT4 is extensive. It represents not only Bertone's initial - and to this day only - road car for the Prancing Horse, but in addition, the square-jawed coupe was Ferrari's first mid-engine 2+2, their first road V8, as well as their first mid-engine V8 for the street. And finally, half-way through its production run, the 308 became first Ferrari-badged road car to carry anything less than twelve cylinders. Why all the radical change all at once? One word- Fiat. The largest of Italy's car makers had purchased the much smaller builder of macchine più veloci in 1969, and in order to turn Enzo's concern into a profitable one, determined that production would need to increase considerably. That meant models with greater market appeal, and hopefully sales. Strangely, considering that goal, Fiat also imbued Ferrari with their sense of apathy toward the U.S. market. To that end, and unfathomably for a company known for their 12 cylinder-powered cars, none such powered was officially offered here during the 308 GT4's lifespan. Instead, Ferrari proffered the V6 Dino 246 and later 308 GTB and S, both lovely and curvaceous Pininfarina designs that stood in stark contrast to the angular and somewhat awkward Bertone GTB4. The seller of this 1975 308 GT4 has tried to overcome what he must have perceived as Bertone's failings by infusing his car with a number of Pininfarina styling memes from later years. The result is unique, polarizing, and well, different to say the least. Starting at the back it replaces the Fiat X1/9-like block tail lamps with four round jobs, just like on a 308 GTB. The only difference is that here they're yanked up and popping through the trailing edge of the car like someone gave it an atomic wedgie. Below that the bumper has been replaced with a sculpted fiberglass (assuming that's the material) cap which is surrounded by scoops, slashes and spats. The rear fenders have be flared and strangely enough, so has the engine cover, which now features a rear-facing hump containing a chrome prancer. The rockers are extended and the whole lower half eschews the black-out treatment that's a very common element of the 308's presentation. Bookending those are five-spoke alloys from a much later and far more front engined 550 Maranello, making you wonder what their offset does to the car's handling. Up front, again the bumper has been replaced with a body-colored cap that, while better integrated, makes the car look even more like a contemporary Lotus Esprit than did the original. As perhaps a final ignominy, the doors are festooned with mirrors on comically extended stalks, likely to allow a sightline that shows more than just what's being sucked into the rear-fender top scoops. Opening the long doors reveals an interior that looks, for the most part, just as it did when leaving the factory. The black over red insides are claimed to have been reupholstered, and it looks like it was well done. The only oddity in here is the talisman hanging from the steering column. Out of place and seemingly incongruous in the 308, draped there is what appears to be Spongebob Squarepants' shriveled testicles. The engine looks to be stock, and that means the lovely 2,927-cc quad cam all alloy V8 which, when new, produced 230-bhp. This is an engine that, with its quartet of Weber 40 DCNFs, is as enjoyable to view as it is to hear, and as is to drive a car which it motivates. 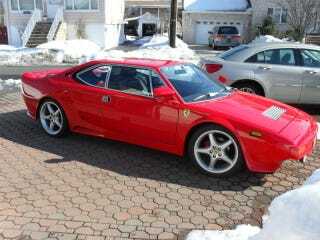 The be-carb'd 308s are some of the last Ferrari models that the shade tree mechanic could realistically tackle, making ongoing maintenance of this car less likely to break the bank. Ferrari wasn't the first maker Bertone offered the 308's design, it having initially been a contender for Lamborghini's Uracco's shape. That ignobility continues to this day as the model remains one of Ferrari's least loved. This seller has tried to change that by incorporating as many styling cues as possible from other, more revered Prancing Horse models, and that makes it, by his claim, one of a kind. Harry Nilsson claimed that one is the loneliest number that you could ever do. Fortunately, this Ferrari (and by '75, the company had shipped over badges to convert all the 308 Dinos into Ferraris) comes with a whole bunch of other numbers to keep it company - forty four thousand to be exact. That's his asking price to be one with this one of a kind 308 GT4. What do you think, is that a price that sould make this custom Ferrari number one in someone's garage? Or, does that make you think the seller is full of number two? Cars.com or go here if the ad disappears. H/T to MissedApproachMN for the hookup!